Processing more than 50,000 tons of rollformed storage racks per year requires a network of magnetic conveyors to keep sheetmetal slugs—or punch-outs—moving throughout the facility and into scrap bins for salvaging. That’s the scenario at Ridg-U-Rak, North East, PA, which expanded its manufacturing plant in 2007 to the tune of $6 million. As a result of the expansion, the plant, which manufactures storage racks used in a variety of industrial, retail and general warehousing applications, upgraded one of its rollforming production lines with a new 200-ton Minster stamping press and a hydraulic cutoff press. It also added a press brake, a new 10-ton coil-handling crane, a 1200-ft. powder-coating line and four new magnetic conveyors. The plant’s rollforming lines include coil feeders and levelers, automatic welders, pre-forming stamping presses (hydraulic and mechanical), rolling mills, line welders, pull-out mills and cutoff press. Magnetic conveyors used at Ridg-U-Rak are equipped with a unique internal drive system designed for low maintenance, quiet operation and long service life. 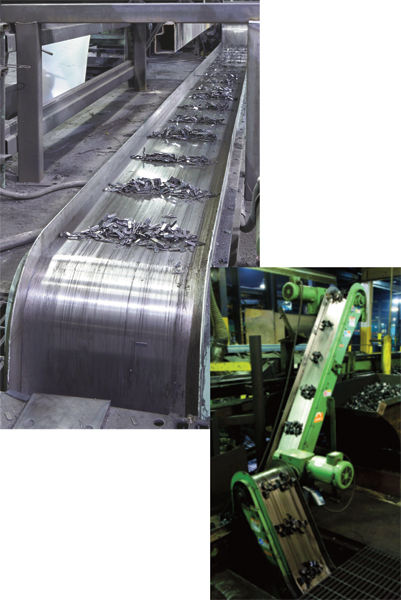 Scrap glides along the conveyors’ stainless-steel slider plate—no moving external parts to jam, break or endanger plant personnel. Except for an externally mounted drive motor, the unit is self-contained and the conveyor mechanism is completely enclosed. Shown above: Scrap that has dropped below floor level onto a horizontal conveyor is lifted vertically into awaiting scrap bins. Creating the vertical- and horizontal-shaped units that ultimately form a storage-rack system starts with coils of black or galvanized steel, measuring up to 18 in. wide and weighing as much as 20,000 lb., according to plant engineering manager Jim Gunter. Once the coils are offloaded, they are placed on one of nine rollforming lines where the steel is fabricated into a series of beams and columns. After the coiled steel is placed on a rollform line, the material is flattened and fed into a hydraulic or mechanical press, where holes are punched into the strip before it feeds through the rollforming stations. Proving particularly challenging to the operation: Conveying the small quarter-sized slugs a from each line to a central under-the-floor conveying line and outdoors to salvage bins. Now, all scrap emanating from hydraulic presses falls onto magnetic conveyors; mechanical presses deposit scrap onto vibratory conveyors, which then moves onto a magnetic conveyor. Ridg-U-Rak’s magnetic conveyor of choice: Eriez models, the latest of which are equipped with a unique internal track system called Tuf-Trac, a drive system designed for low maintenance, quiet operation and long service life. The punch-outs now glide along the conveyors’ stainless-steel slider plate—no moving external parts to jam, break or endanger plant personnel. Except for an externally mounted drive motor, the unit is self-contained and the conveyor mechanism is completely enclosed. “We use several types of Eriez conveyors to move all the slugs into scrap tubs, which then are picked up by a local recycling company,” says Gunter, noting that the plant runs 10 Eriez magnetic conveyors in all, the last four of which are Tuf-Trac models installed as part of the 2007 expansion. In another area of the plant, the punch-outs are dropped below floor level onto an Eriez horizontal conveyor that lifts the slugs 6 ft. vertically into awaiting scrap bins. The bins then are emptied outside into the reclaim hoppers. Because of their liquid-tight construction, the lower conveyor sections can be completely submerged in coolant sumps or tanks. The working face is self-cleaning, and excess fluids drain back into the tank—a product feature that ultimately convinced Gunter to install the Eriez conveyors. The majority of the Eriez conveyors installed at Ridg-U-Rak are Model 6 units with 14.5-in.-wide slide plates. The Tuf-Trac design allows the drive chain to ride in an oil-impregnated UHMW (ultra-high molecular weight) track. The design eliminates the need for oil inside the conveyor housing. Magnets are located on 12-in. centers and supported by twin roller chains powered by a shaft-mounted motor reducer. The conveyors come with spring-loaded chain take-up. Article provided by Eriez, Erie, PA: 888/300-3743; www.eriez.com. India's leading manufacturers and suppliers of Industrial rack and industrial sheds. Best industrial racks manufacturers in india.